Cladribine is an anti-Cancer drug that is used to treat hairy Cell Leukaemia. This is available as a generic drug that is injected either via the subcutaneous route under the skin or as an intravenous infusion. 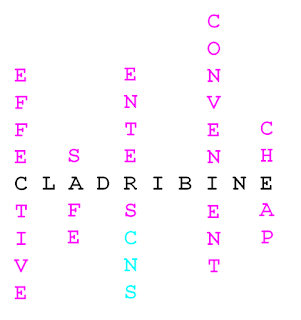 In 2010 an oral Produg of Cladribine called Movectro was Shown to be Effective in the Control of Multiple Sclerosis. Giovannoni G, Comi G, Cook S, Rammohan K, Rieckmann P, Soelberg Sørensen P, Vermersch P, Chang P, Hamlett A, Musch B, Greenberg SJ; CLARITY Study Group. A placebo-controlled trial of oral cladribine for relapsing multiple sclerosis.N Engl J Med. 2010 Feb 4;362(5):416-26. BACKGROUND:Cladribine provides immunomodulation through selective targeting of lymphocyte subtypes. We report the results of a 96-week phase 3 trial of a short-course oral tablet therapy in patients with relapsing-remitting multiple sclerosis. 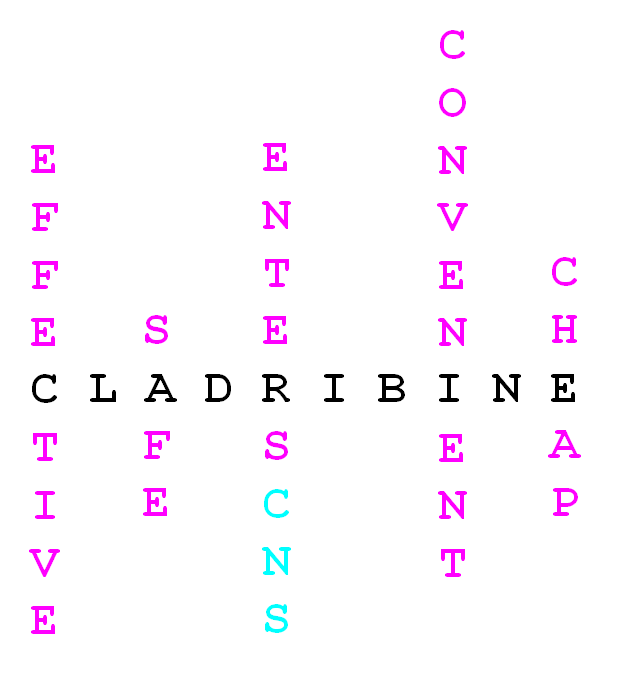 METHODS:We randomly assigned 1326 patients in an approximate 1:1:1 ratio to receive one of two cumulative doses of cladribine tablets (either 3.5 mg or 5.25 mg per kilogram of body weight) or matching placebo, given in two or four short courses for the first 48 weeks, then in two short courses starting at week 48 and week 52 (for a total of 8 to 20 days per year). The primary end point was the rate of relapse at 96 weeks. Cook S, Vermersch P, Comi G, Giovannoni G, Rammohan K, Rieckmann P, Sørensen PS, Hamlett A, Miret M, Weiner J, Viglietta V, Musch B, Greenberg SJ; CLARITY Study Group.Safety and tolerability of cladribine tablets in multiple sclerosis: the CLARITY (CLAdRIbine Tablets treating multiple sclerosis orallY) study.Mult Scler. 2011 May;17(5):578-93. What happened next. Read this Blog.